Combine kit supplements of OptiVERO. Prepare complementary reagents. Wash cells to remove traces of FBS and harvest from growth surface. Seed in OptiVERO and grow to confluence. Add desired virus to be expanded in minimal basal EMEM. Incubate for 2 hours at 37°C. Add fresh OptiVERO. Allow virus expansion for 3-13 days. Quantify virus by desired method. VERO cells are one of the most common continuous cell lines used in laboratory and industrial settings. While they have many important applications in research, one of the most critical is as a preferred cellular substrate for virus production . VERO cells are traditionally grown in 10% fetal bovine serum (FBS) and exhibit commercially acceptable doubling times and viability. However, current guidance by regulatory bodies in addition to Good Manufacturing Practice (GMP) compliant manufacturing of cell-based, advanced therapy medicinal products (ATMPs) states that alternatives to FBS should be utilized due to poor reproducibility and safety concerns associated with FBS use [2,3]. Popular serum free media (SFM), such as VP-SFM, contain high levels of hydrolysates that can cause batch-to-batch variability. OptiVERO was designed to eliminate these concerns and is a chemically defined and blood-free (serum free) media. Here, we compare VERO cell growth and virus production in OptiVERO vs FBS containing media in 2D cell culture flasks. To generate 1 liter of complete OptiVERO, thaw one OptiVERO Media Supplement (20mL) and one OptiVERO Protein Supplement (10 mL) in a 37°C water bath. Do not subject the Protein Supplement to multiple freeze-thaw cycles. Once the supplements are completely thawed, gently stir each supplement by pipetting up and down. Do not vortex. This medium contains HEPES and glutamine source. If desired, add gentamicin/amphotericin to 0.1-0.5x final. Do not add to a 1x final concentration. Prior to infection studies, VERO cells should be allowed to adapt to OptiVERO for at least 3 passages. VERO cells should be grown to confluence in the desired flatware. The virus to be expanded should be inoculated at 0.001 - 0.01 PFU/cell in basal (0.06 mL/cm2). To ensure uniform infection over the entire monolayer, VERO cells should be incubated at 37°C for 90 minutes after inoculation, with gentle rocking of the flask every 15 minutes. Specific protocols for virus propagation are dependent on virus type. For the attenuated Dengue strain used here, for example, culture glucose (2 g/L) and neutral pH were maintained by the addition of 45% glucose and 7.5% sodium bicarbonate solutions, respectively. Here, a blood- and serum-free, chemically defined virus-production media known as OptiVERO is evaluated for its ability to support VERO virus production, compared to media supplemented with FBS and to VP-SFM. An attenuated Dengue strain was used as a model virus to demonstrate the virus production capabilities of each medium (Figure 1). Dengue was propagated for 12 days, with samples removed for plaque titration every other day. 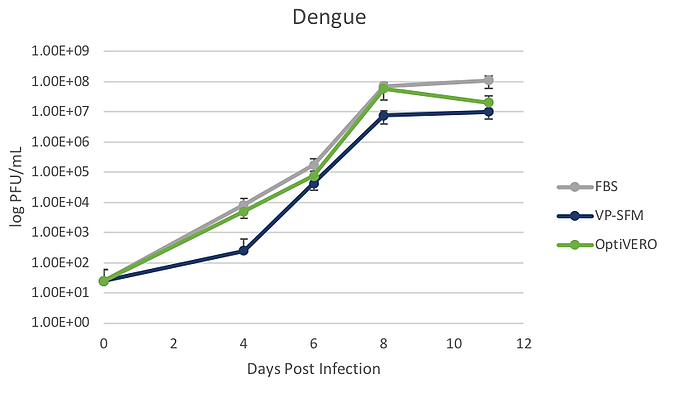 The Dengue virus growth plateaued at day8 and was determined to be 7.25E+7, 7.5E+6, 6.00E+7 PFU/mLfor EMEM + 10% FBS, VP-SFM + 4 mM Glutamine, and OptiVERO, respectively. These data show that VERO cells grown in OptiVERO virus production capabilities similar to those grown in 10% FBS and exhibited superior virus production to hydrolysate-containing medium, VP-SFM. 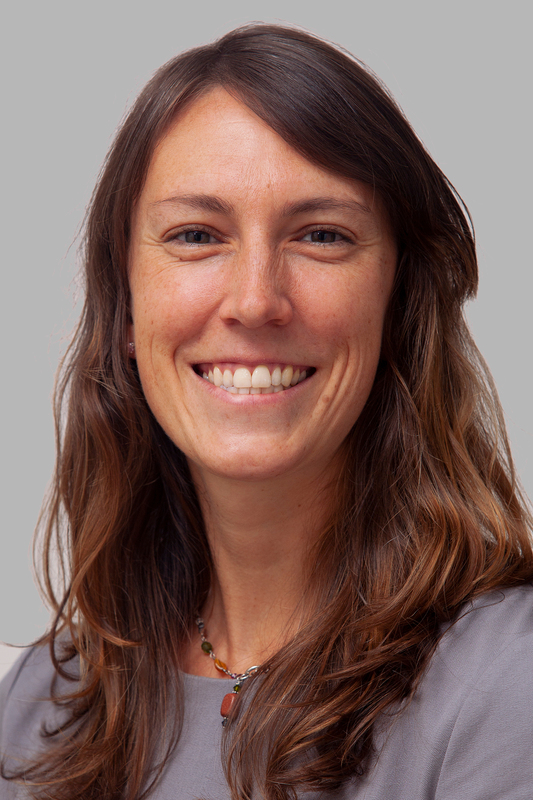 Annie Cunningham joined InVitria in 2018 as a Cell Culture Scientist. After graduating from Michigan State University, Annie began her career at Seattle Genetics developing potency assays for antibody-drug conjugates for cancer treatment. Annie shifted focus into immunotherapy and contributed to the development of the CAR T program at Juno Therapeutics. After moving to Colorado in 2017, Annie continued researching the human immune system as it relates to the gut microbiome at the University of Colorado. In her role at InVitria, she enjoys the new challenge of formulating completely blood-free, chemically defined cell culture media for the scalable and sustainable manufacturing of life-saving medicines.